Hats off to the All American 'Lob-stah Roll'! As you disembark the plane at Boston’s Logan International you can feel your mouth salivating for one of Massachusetts’ famed lobster rolls, or in the native tongue of a true Bostonian “Lob-stah” roll. 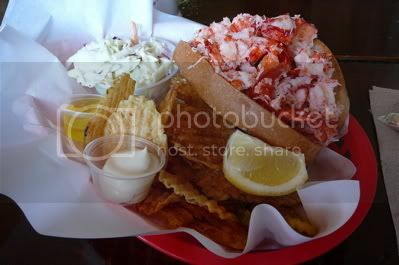 We had our long standing favorite lobster roll from the reliable Squire in quaint (and preppy) Chatham. Side track: Chatham is the quintessential Cape Cod town with its white picket fences, bandstands, some kitschy galleries and lot of gingham and madras patterns on the natives. But I digress, back to the lobster roll quest. The lobster roll at the Squire does not try to be anything more than a simple lunch item, albeit expensive. It is served on a plastic basket lined with wax paper with chips on the side. The soft hot dog bun has uncrusted sides, traditionally you are supposed to butter and toast the side of the bun but I tend to think it ruins the succulent taste of the lobster meat. The Squire seems to agree and they too leave the bun untoasted. 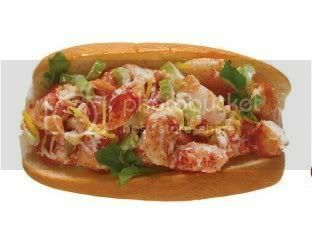 As for the lobster meat, they have nice chunks of lobster with about two tablespoons of mayonnaise combined with some chopped celery and salt and pepper. So simple but so good but NOT a “cheap eat” at $17.95. I’d like to see Rachael Ray try to eat her way through the Cape on $40 a day! Obviously we had to have a point of comparison so we tried a couple more rolls on the Cape. Cook’s in Orleans, another Cape town just 5 minutes from beautiful Nauset Beach, is far more traditional. Traditional in this sense means grease and fried bread. Not my style, however the lobster was excellent but I found the combination with the grilled buttered bun to ruin the delicate lobster flavors. A little cheaper than the Squire at $14.95. To be honest, I was a little disappointed in some of the other rolls that were either grilled with butter or the soft bun quickly became soggy from too much mayo. By the way, this is one of the major reason restaurants grill the bun. With that said, I decided it was my turn to attempt a version of the lobster roll. For a first try, it wasn’t bad and I added a secret ingredient (cayenne). Here’s my recipe for 2 lunch sized lobster rolls. Directions: To make the lobster salad combine the bite size lobster pieces, celery, mayonnaise, cayenne, lemon, salt and pepper. Refrigerate for 2 hours. When ready, place lobster mixture in soft bun and serve with cracked pepper. For garnish, place on white plate with salt and vinegar potato chips and celery sticks.